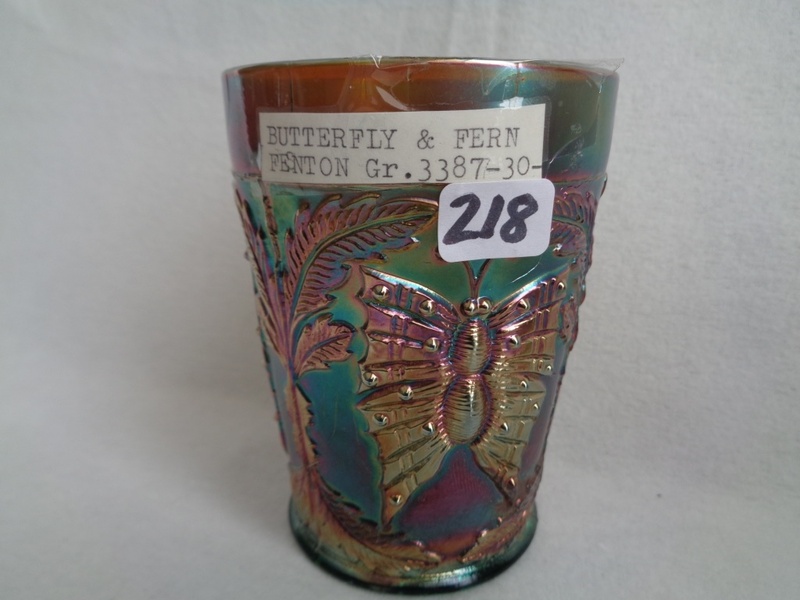 Another of the numerous Fenton patterns in which only water sets were produced. 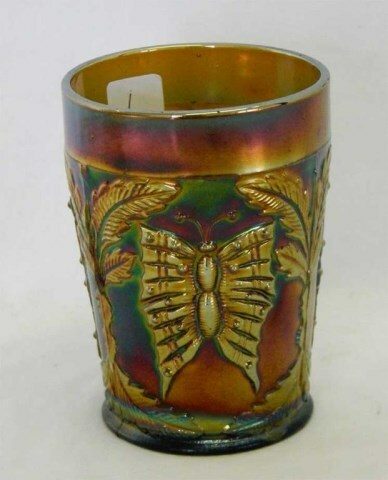 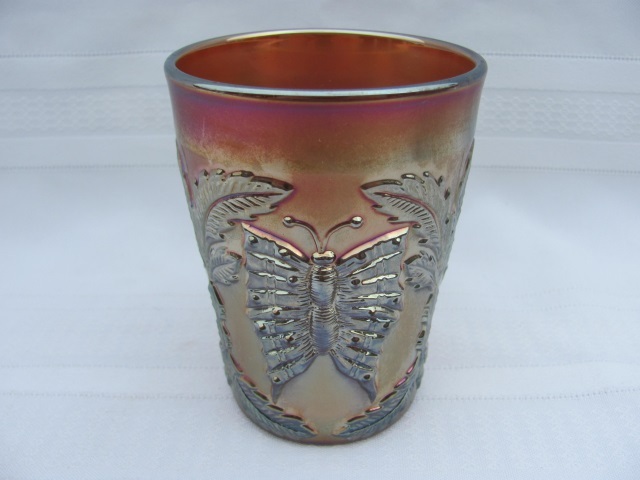 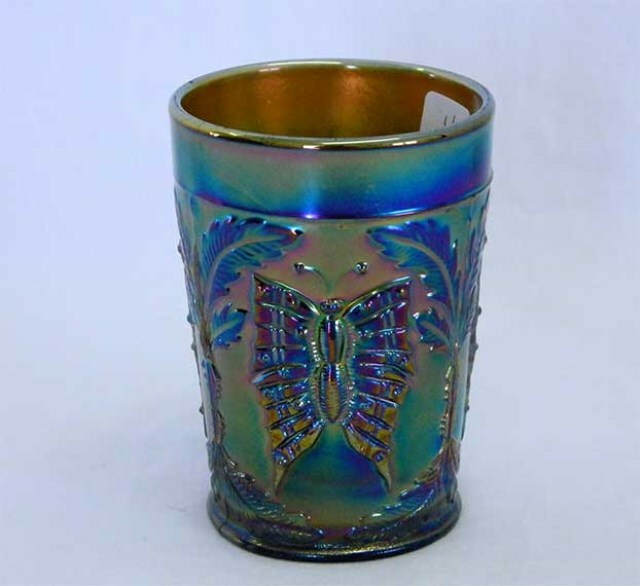 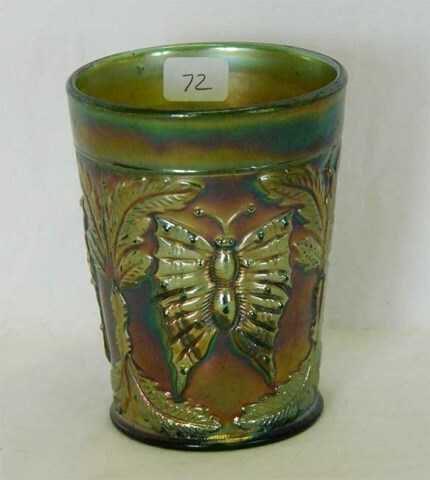 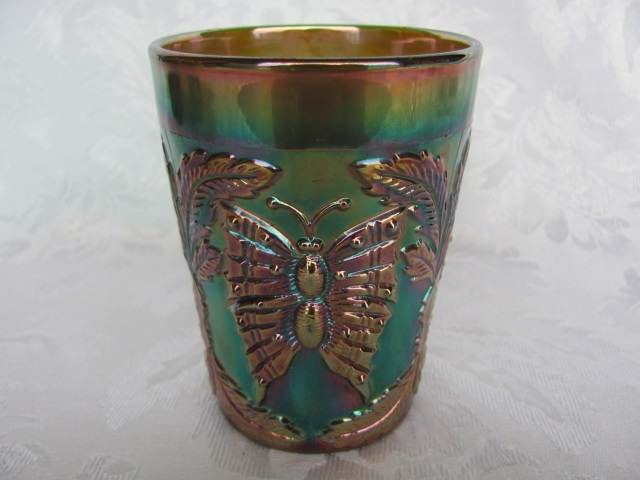 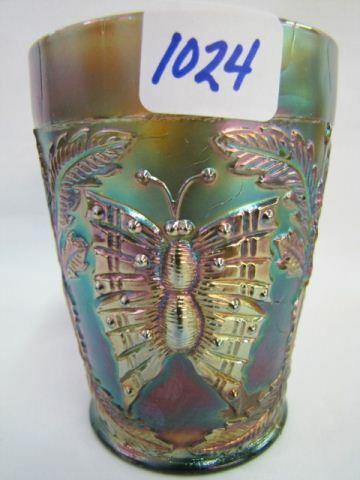 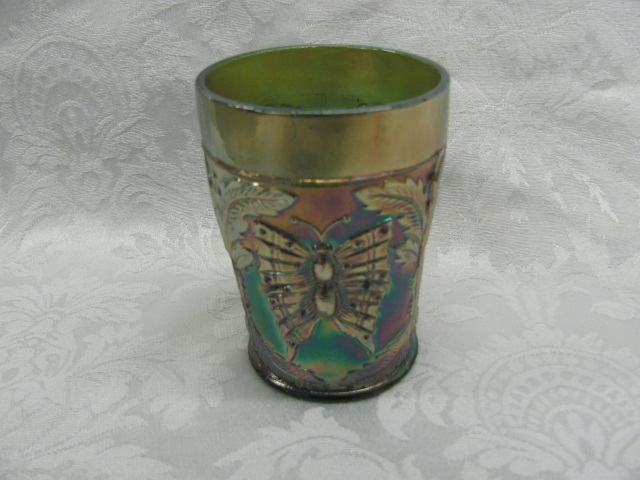 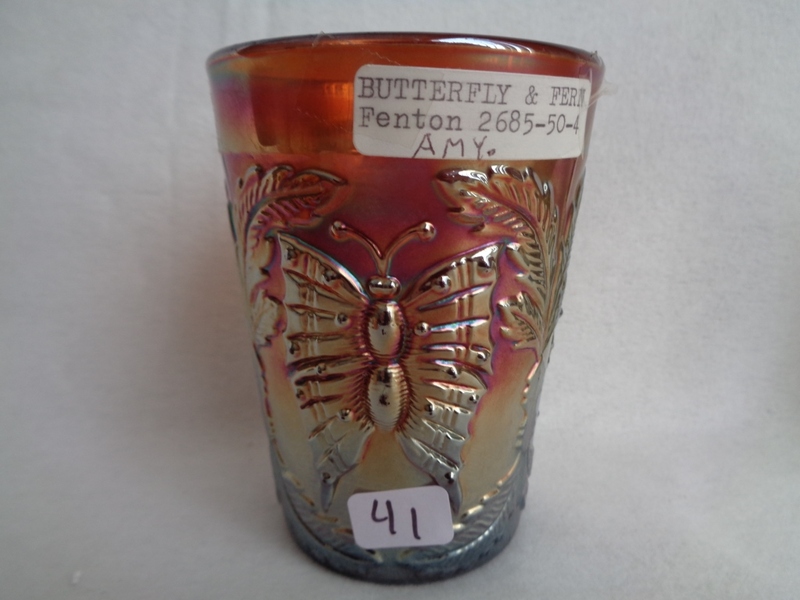 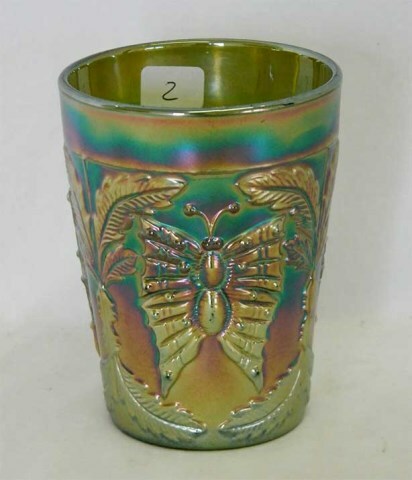 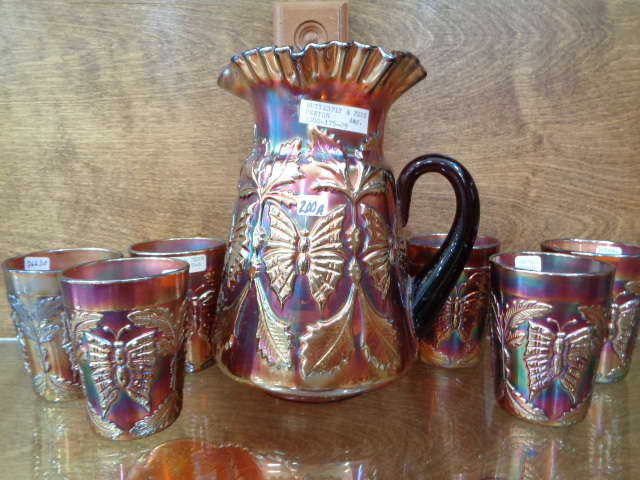 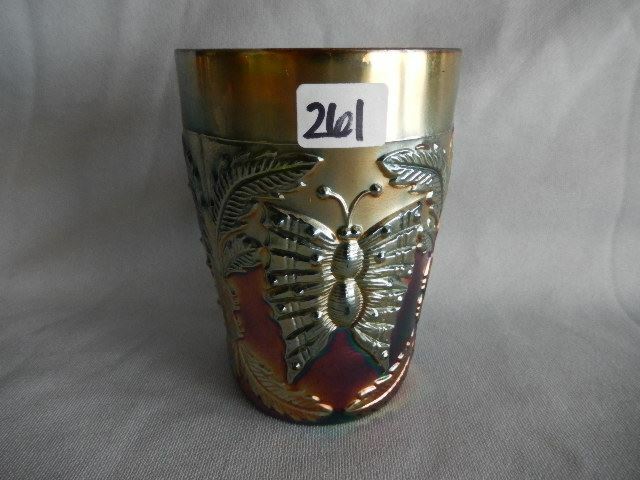 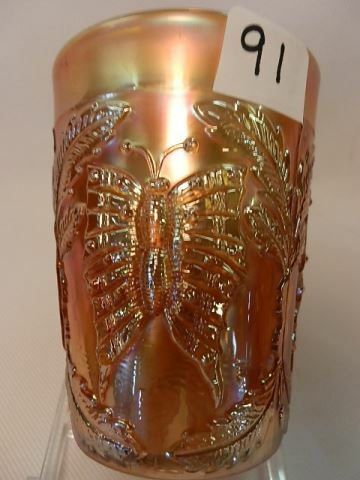 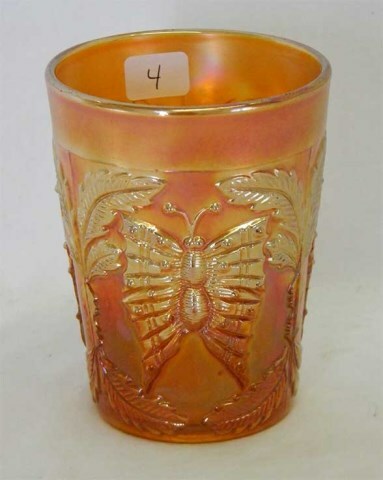 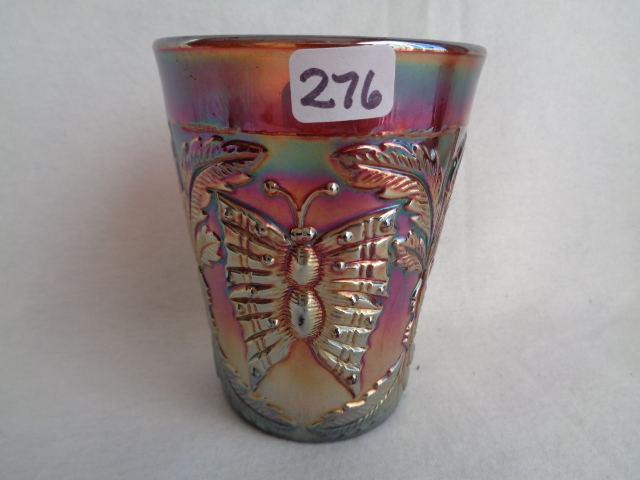 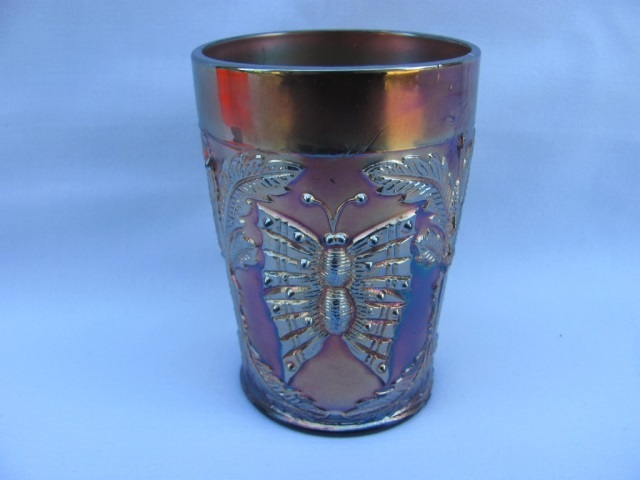 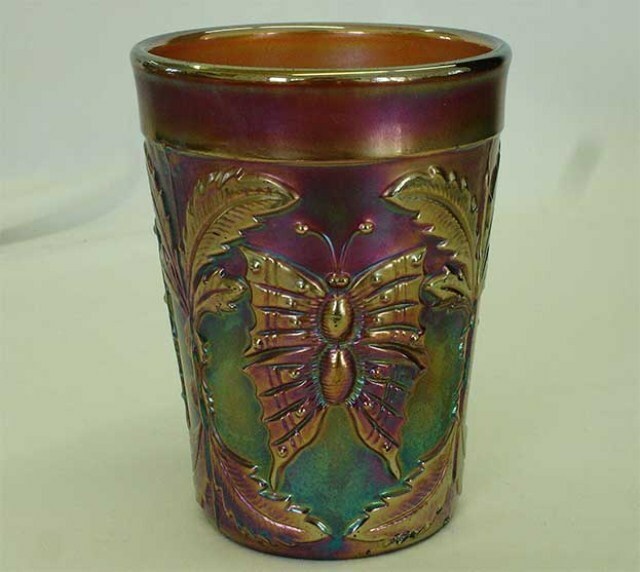 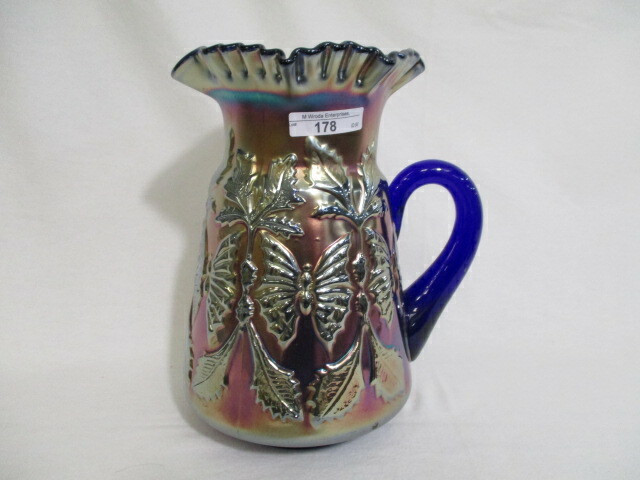 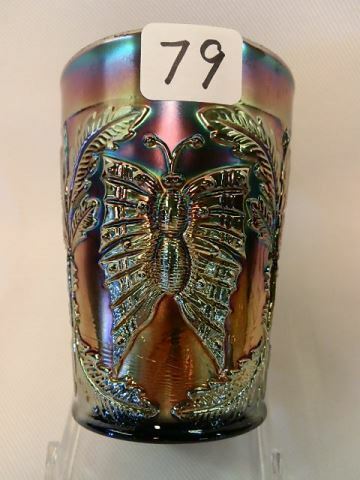 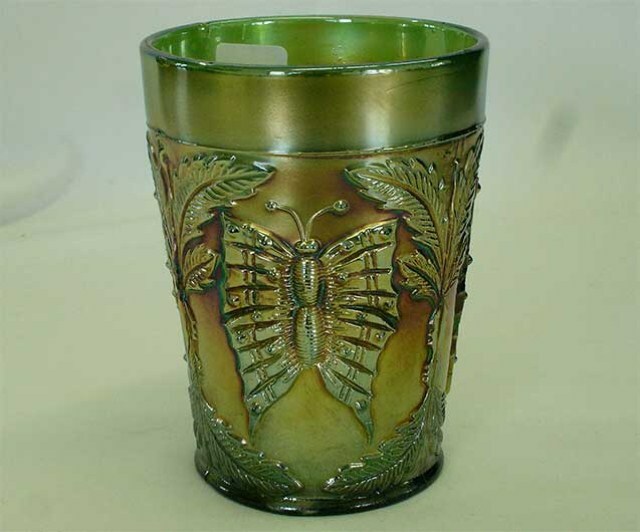 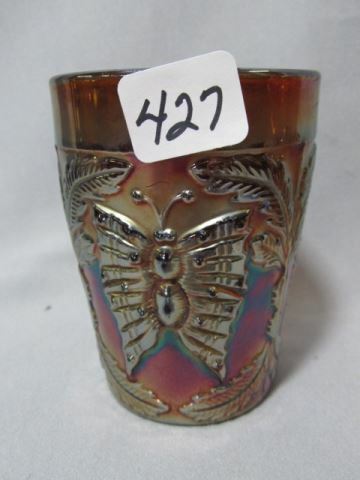 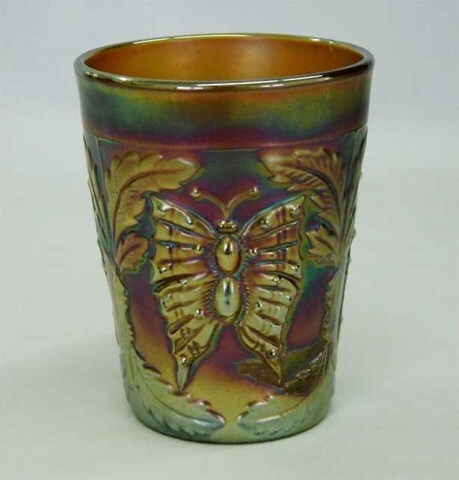 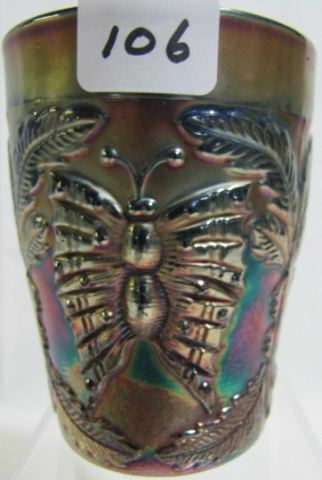 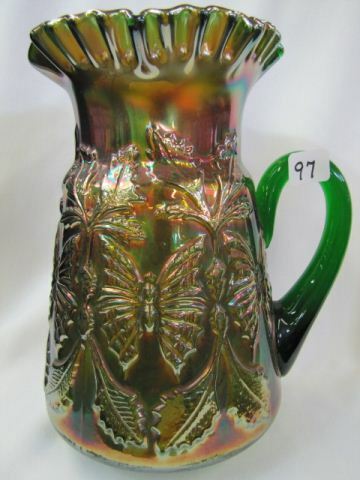 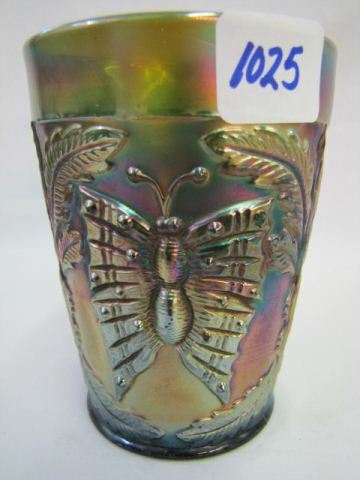 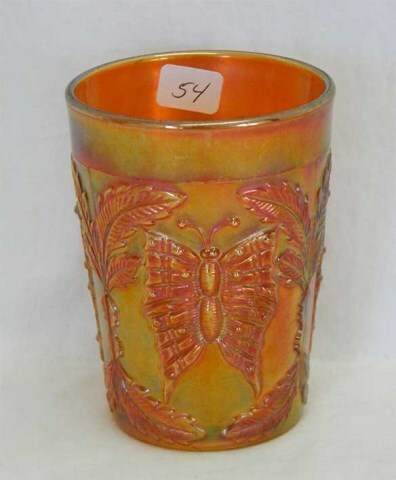 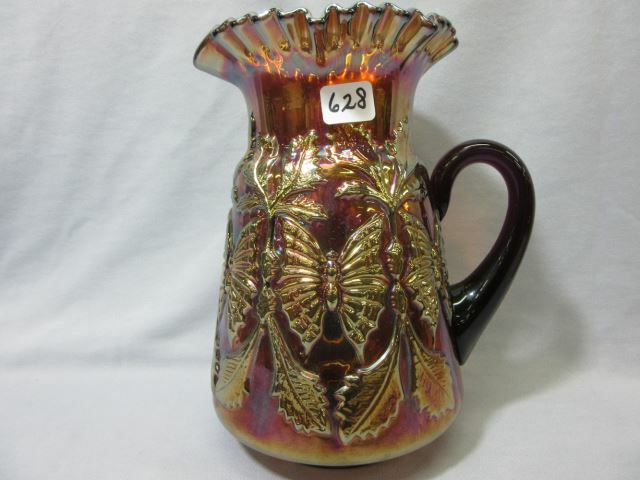 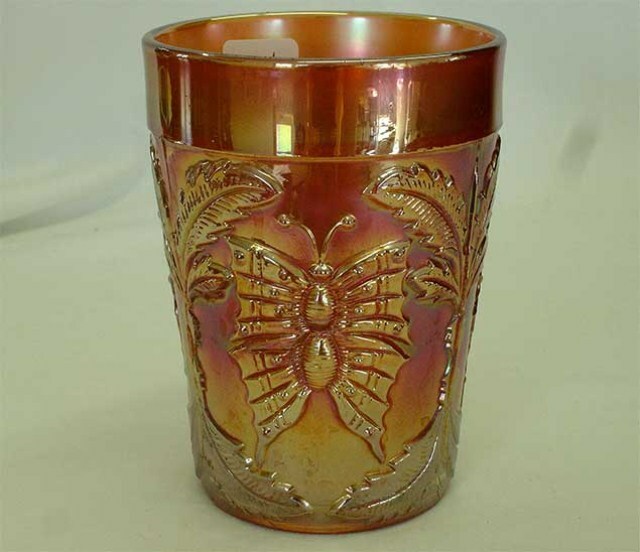 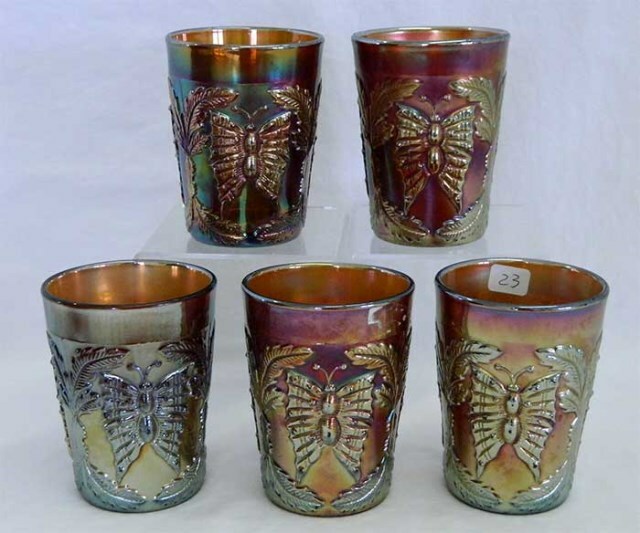 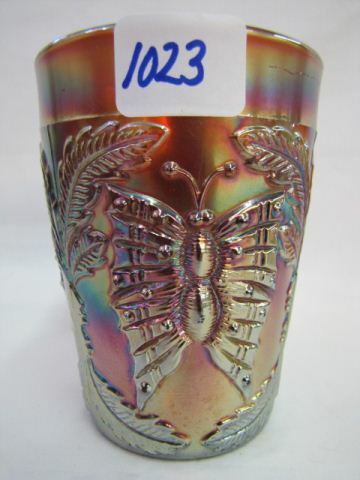 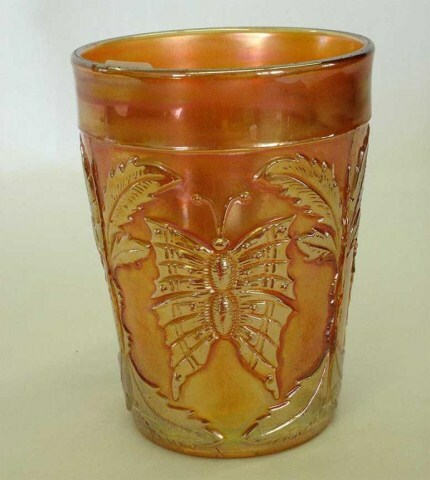 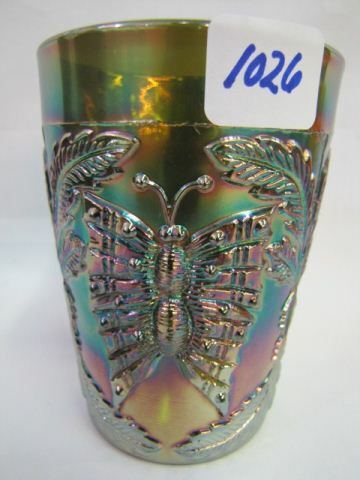 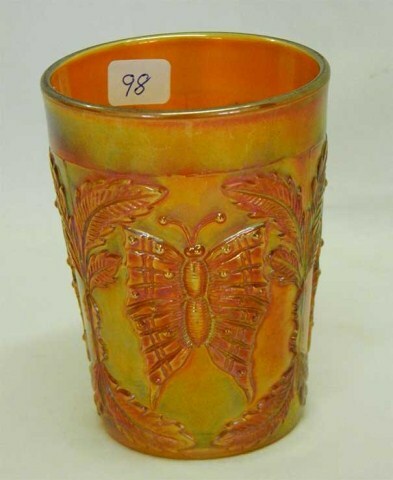 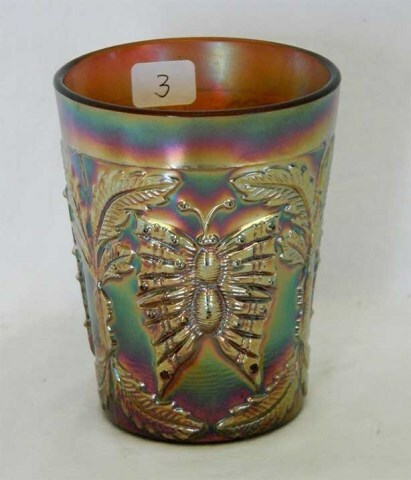 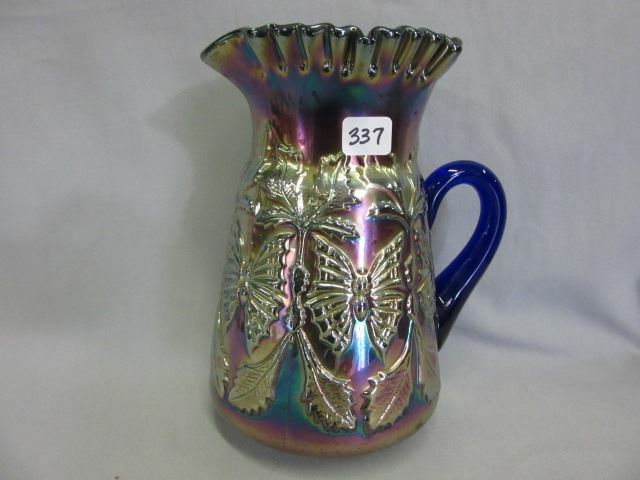 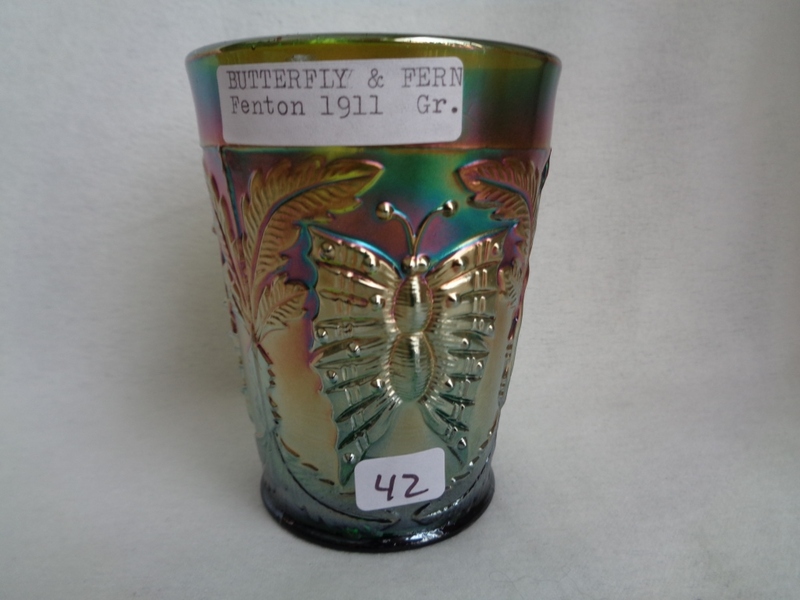 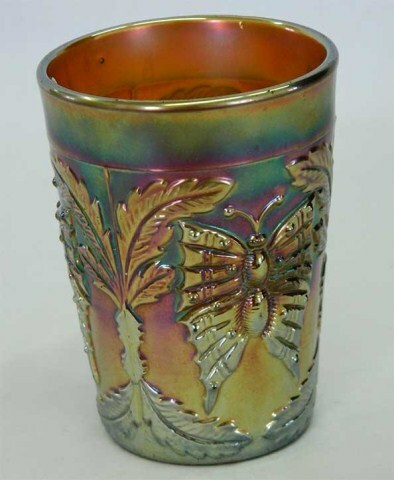 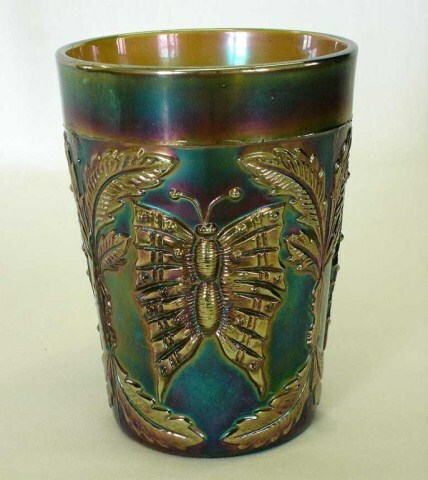 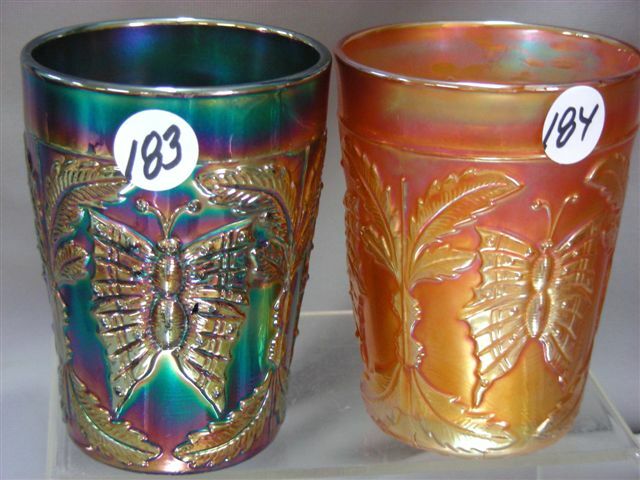 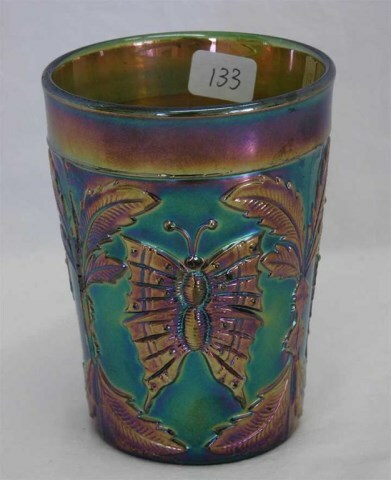 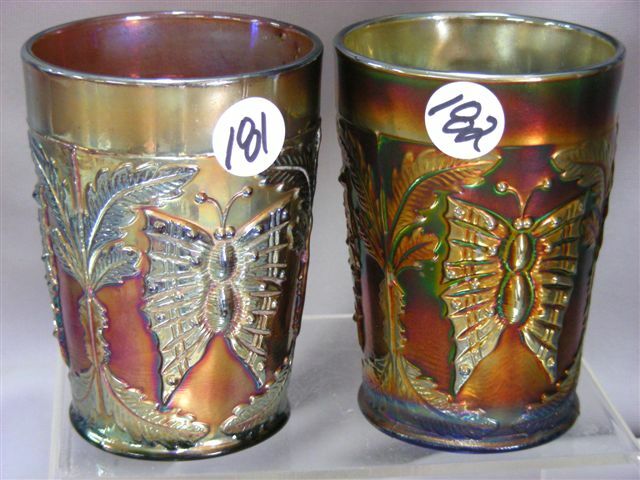 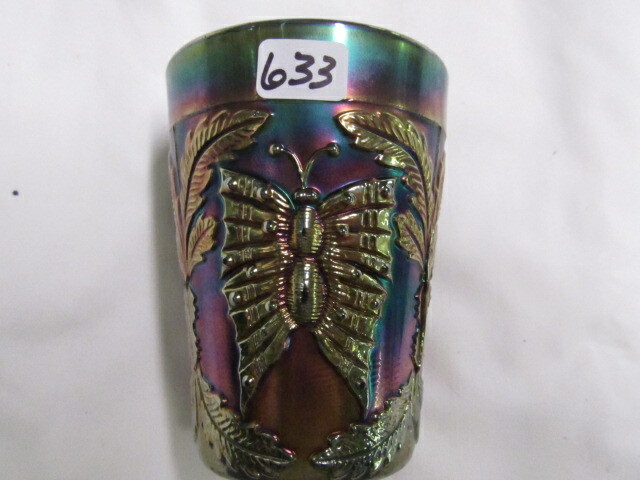 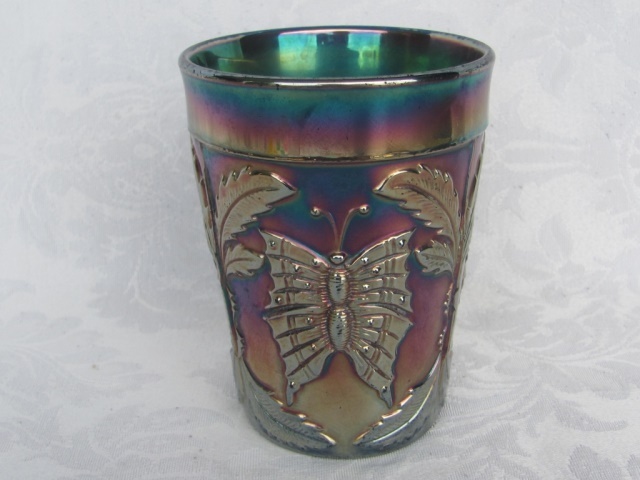 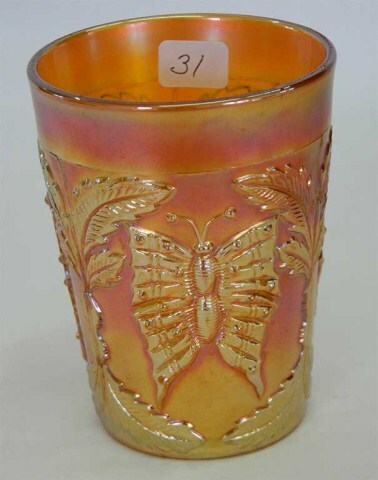 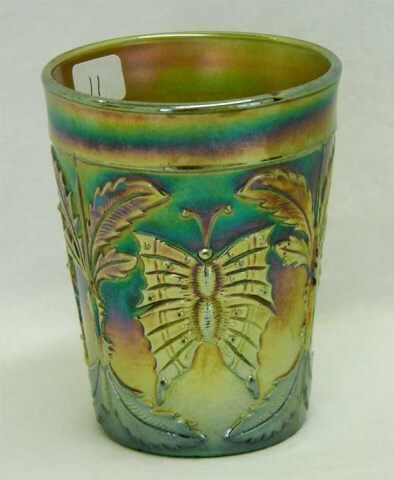 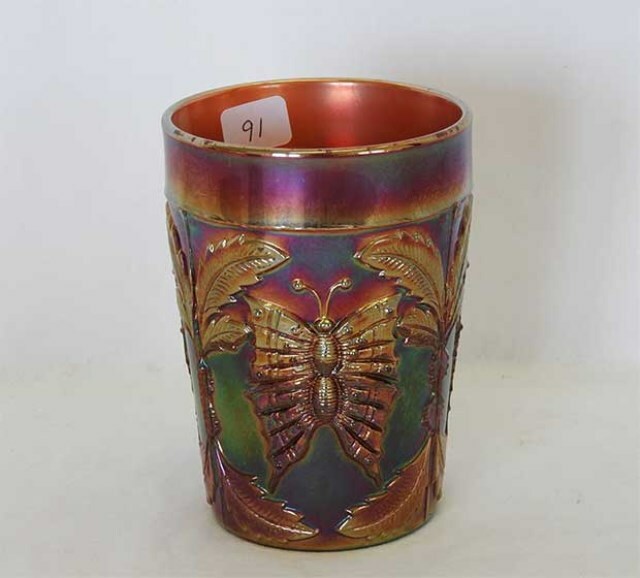 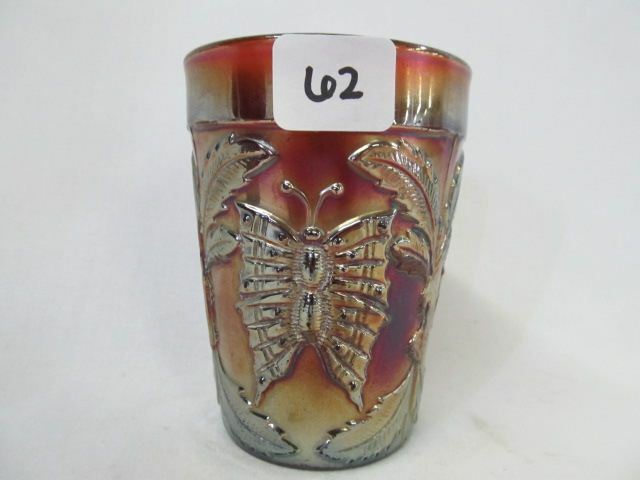 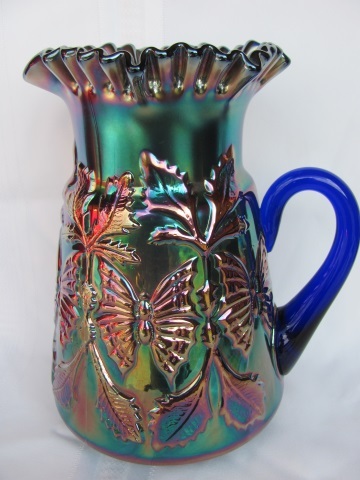 It is sometimes called Butterfly & Plume as plumes are the shapes at the bottom of the pieces. 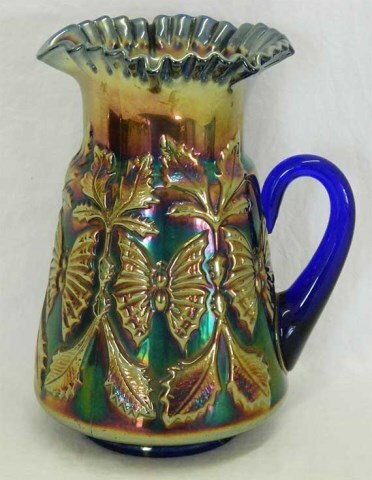 Colors are amethyst, blue, green, and marigold. 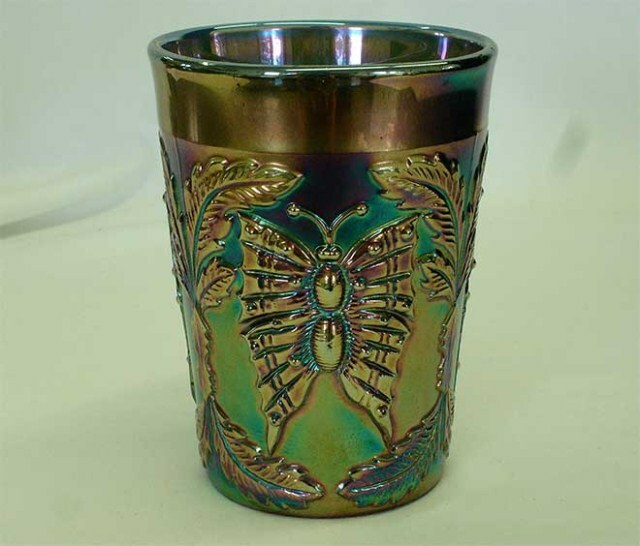 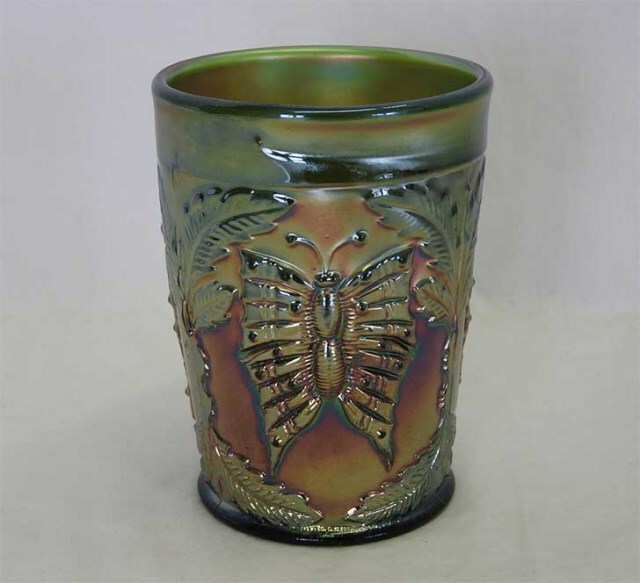 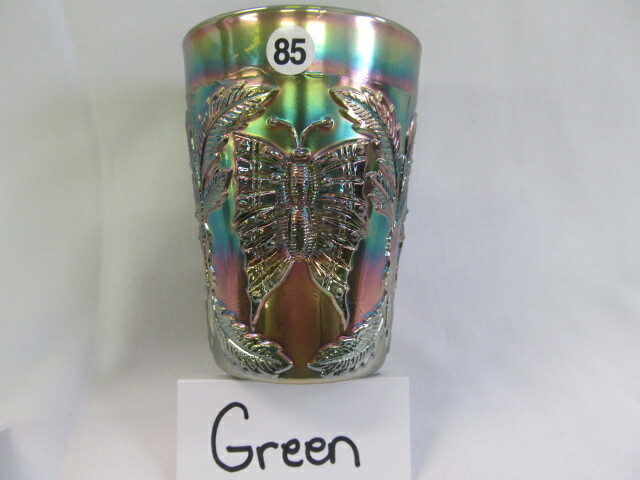 Most tumblers you see will have a base that had been ground smooth at the factory. 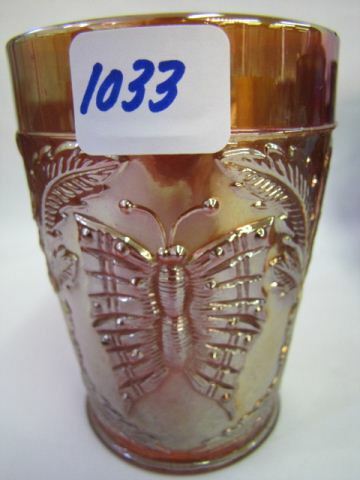 Those that were not ground are called the variant, though that seems to make little difference in the value. 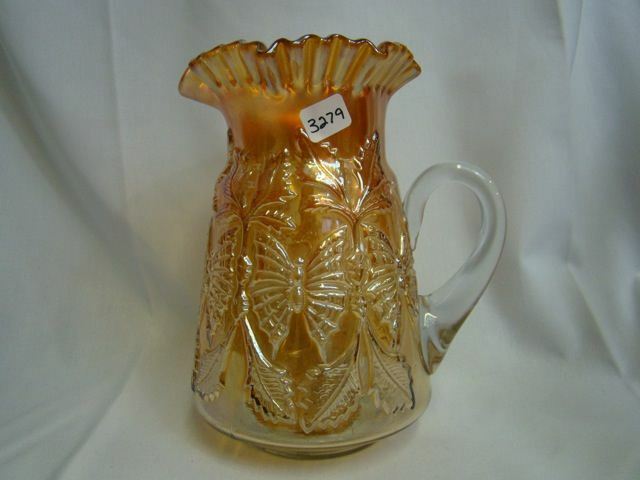 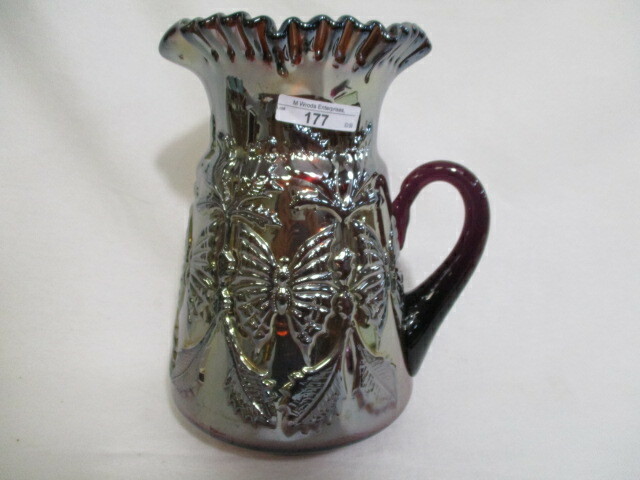 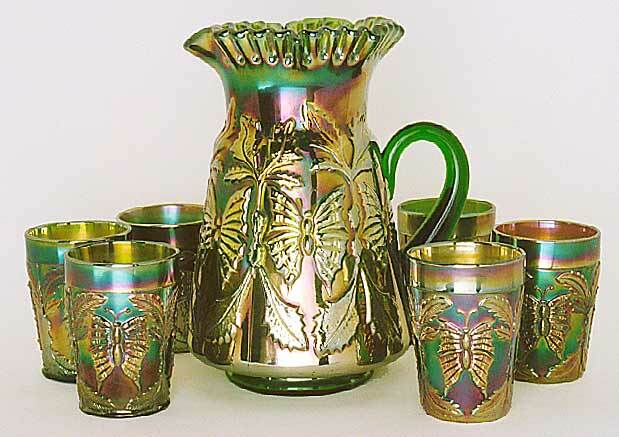 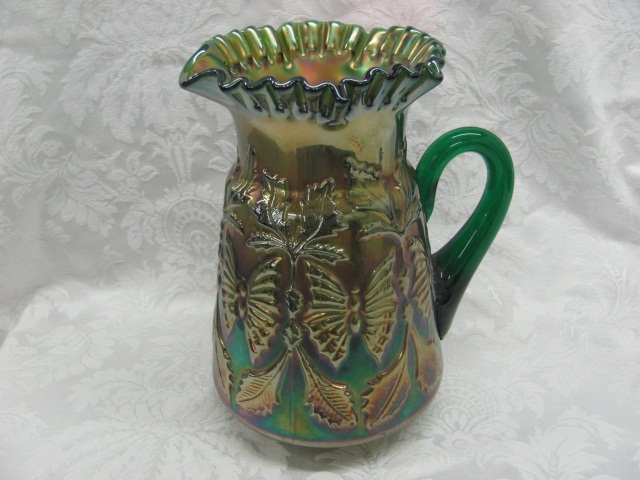 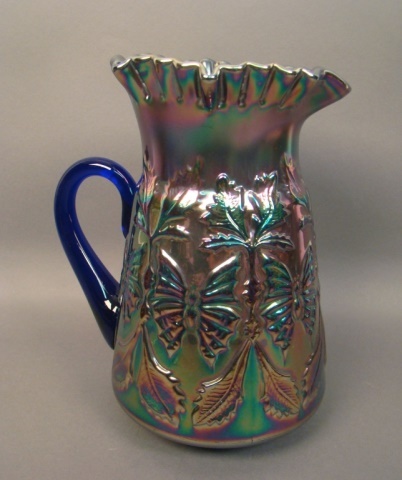 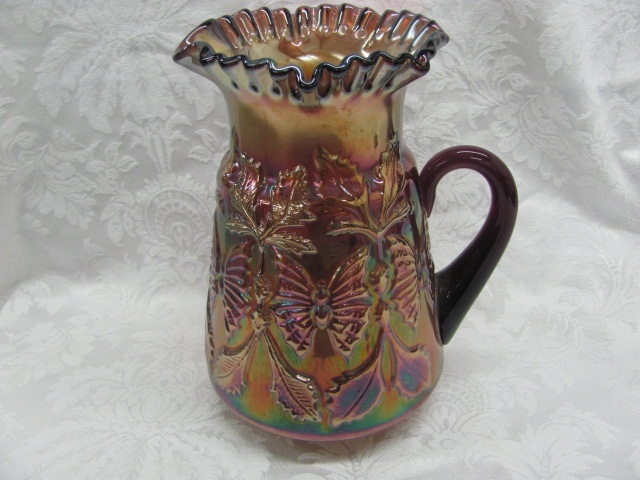 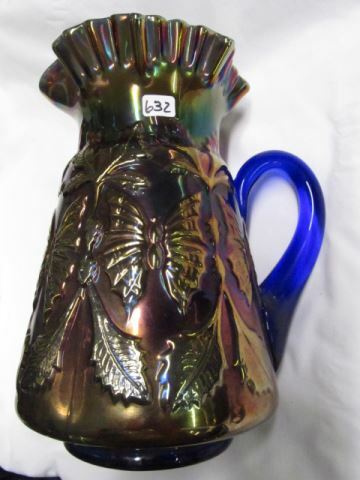 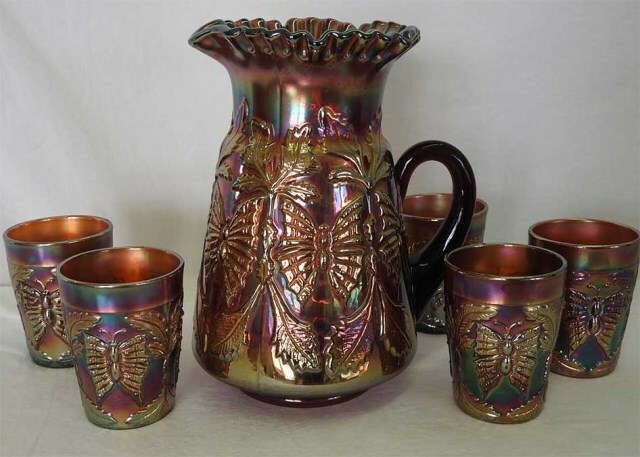 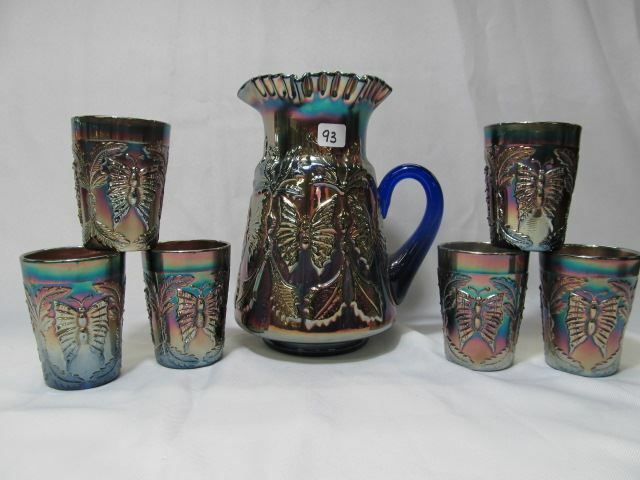 When first designed, the pitcher lacked the ferns and plumes. 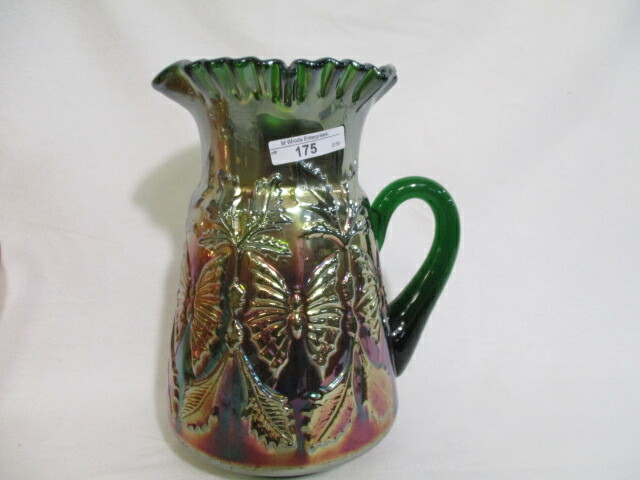 To see an example of this, click here. 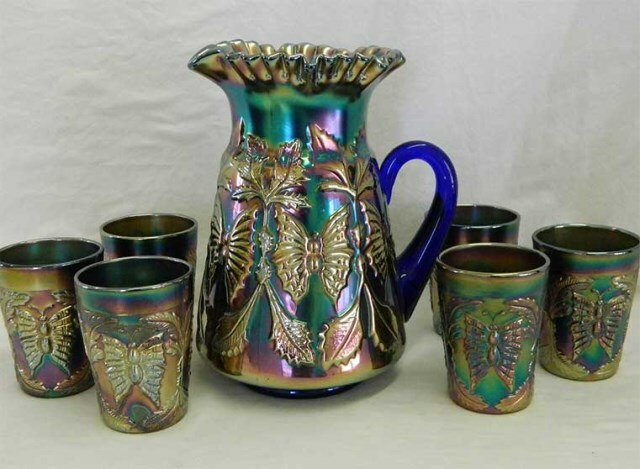 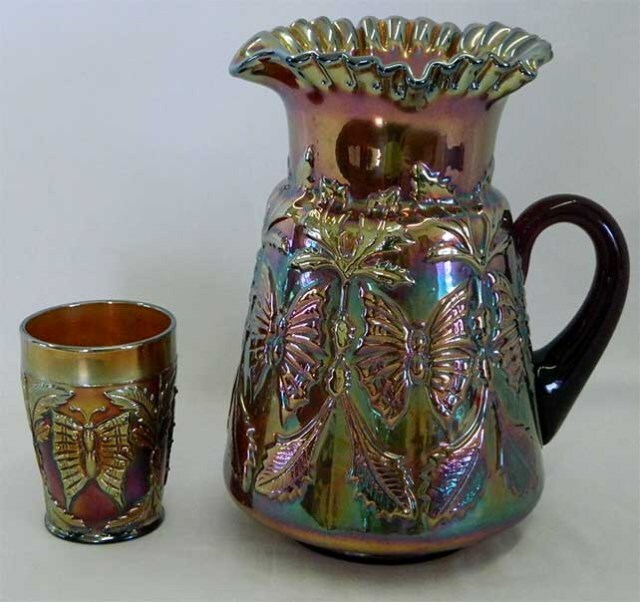 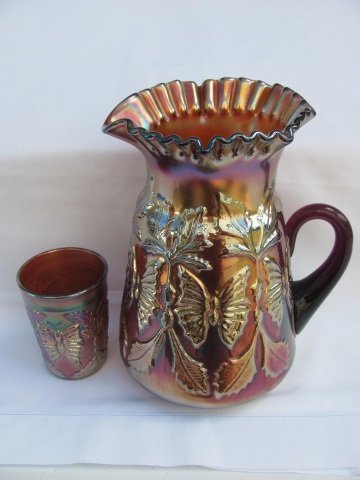 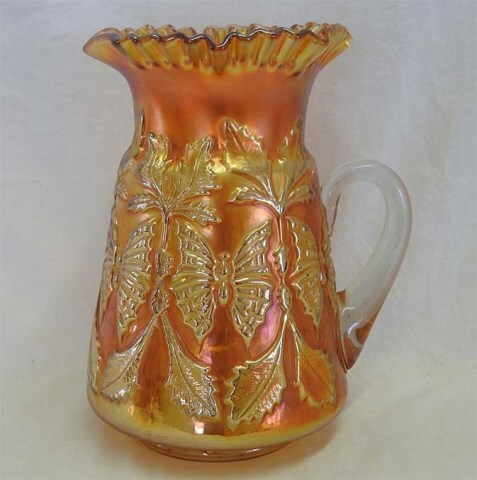 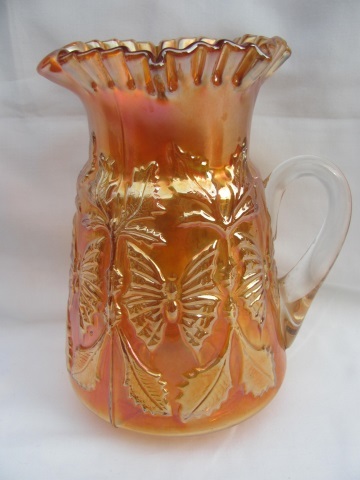 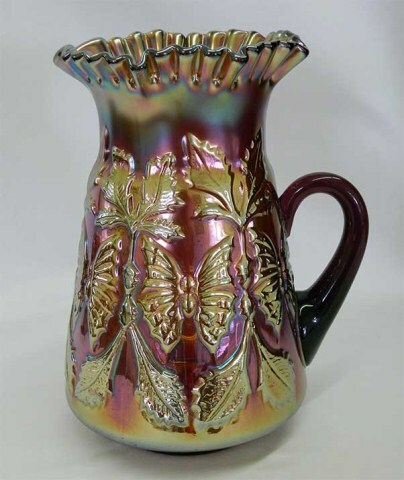 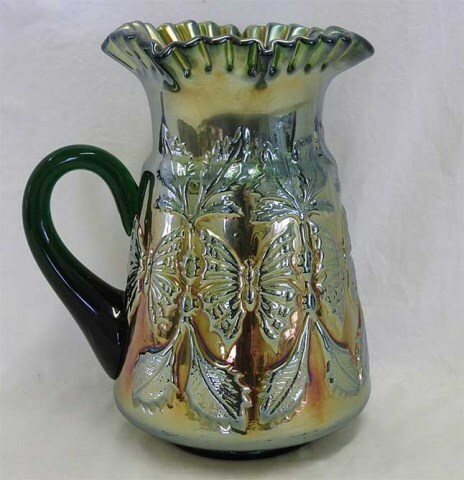 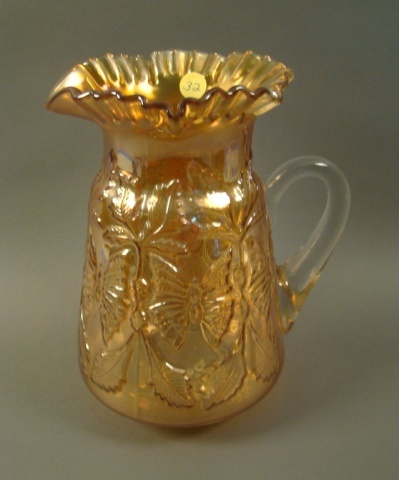 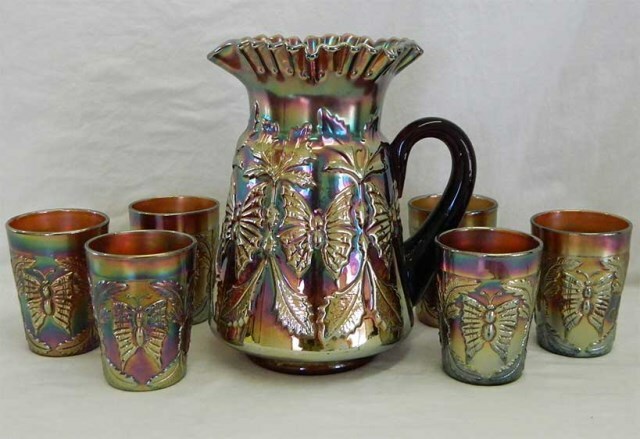 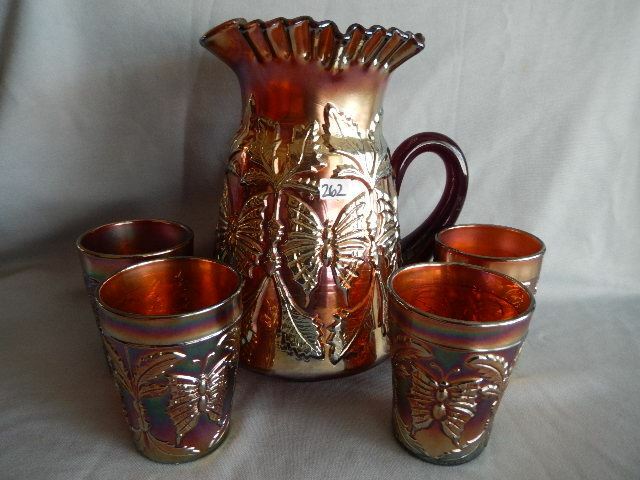 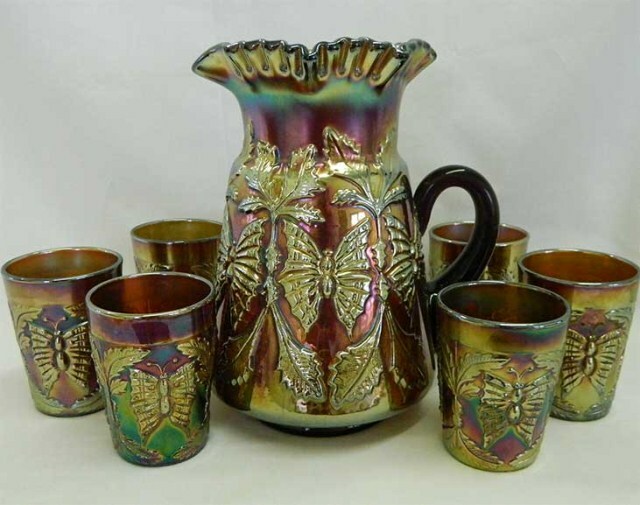 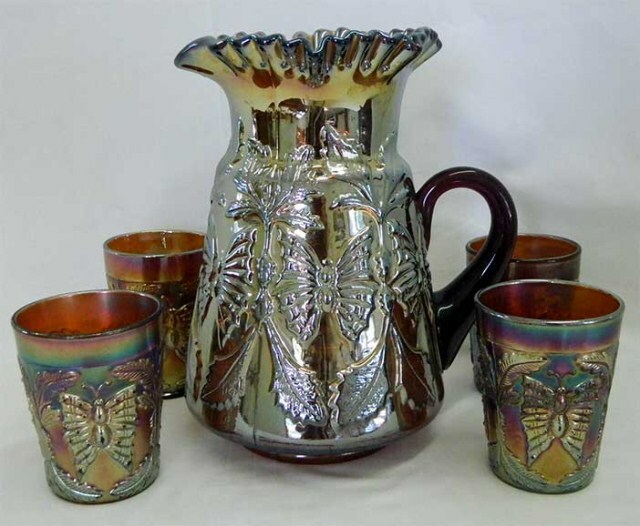 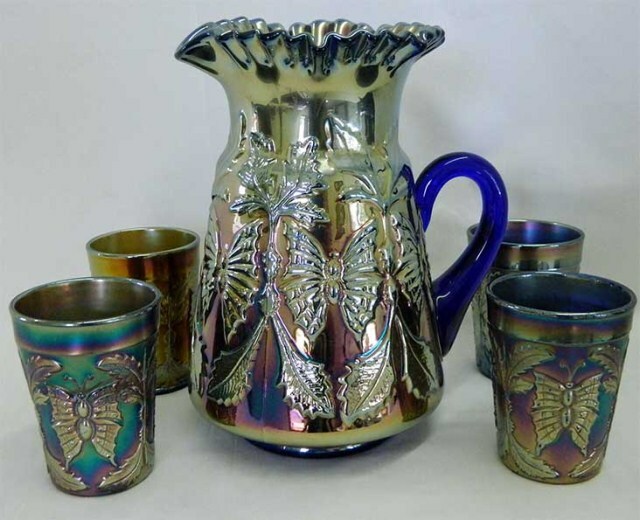 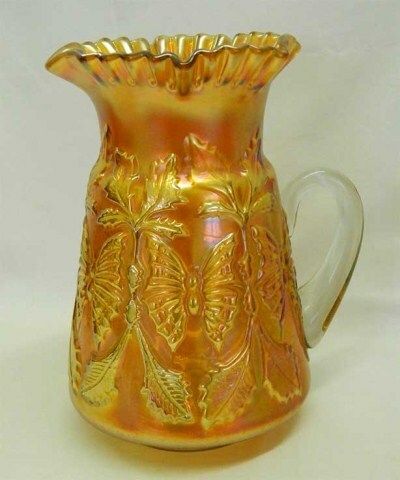 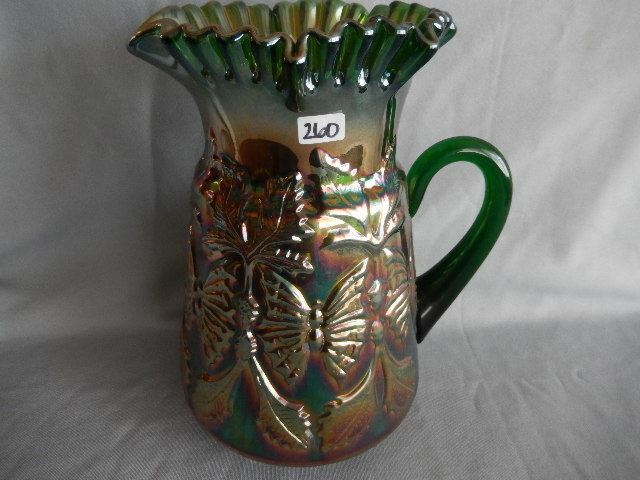 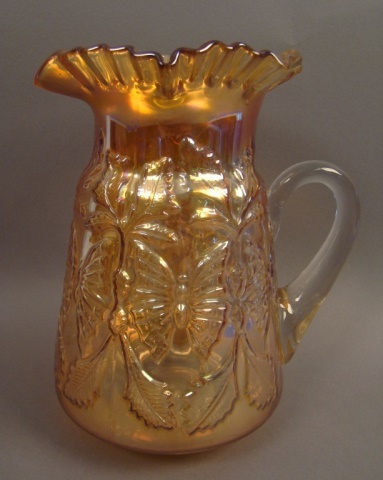 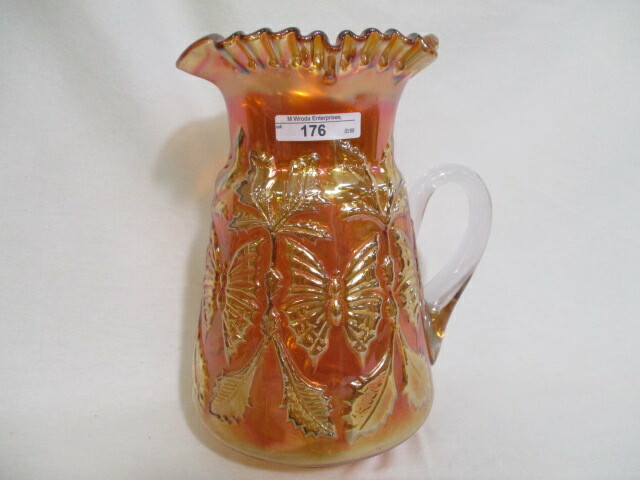 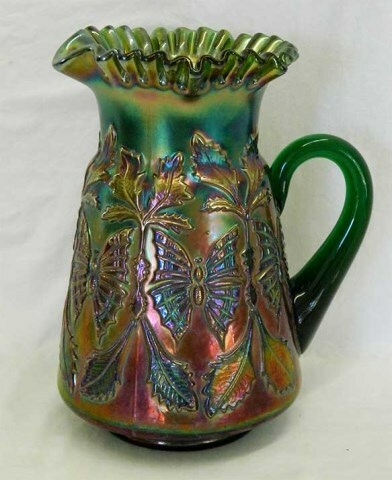 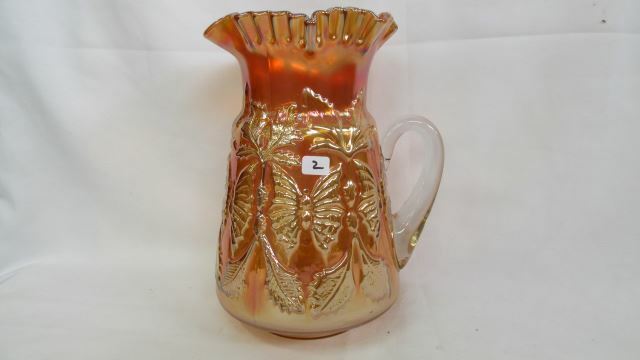 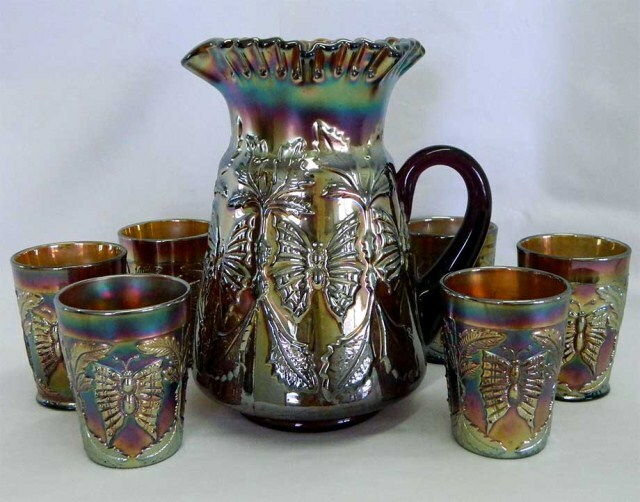 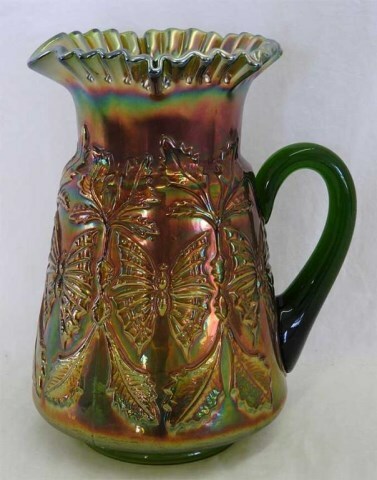 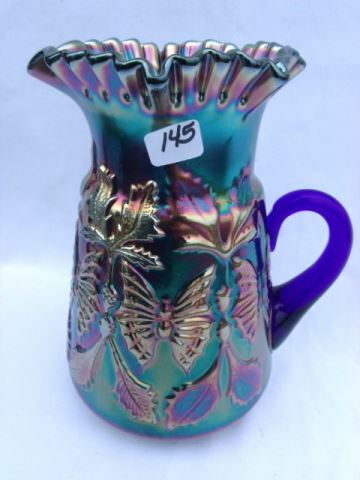 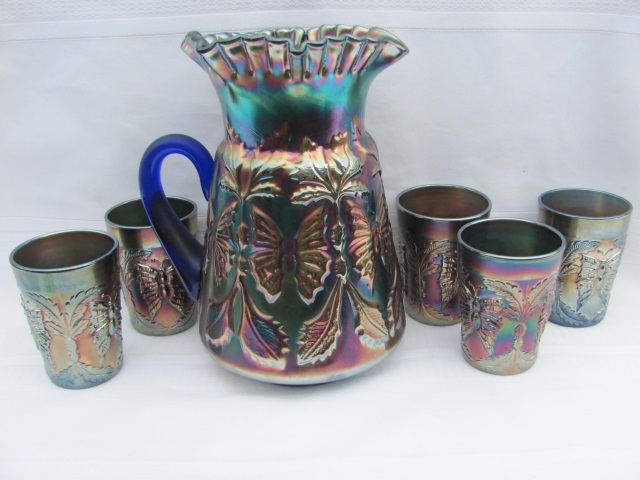 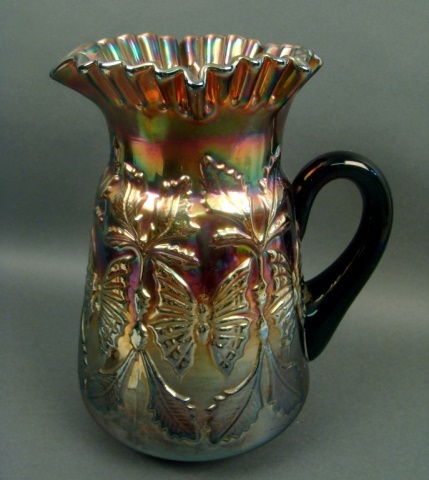 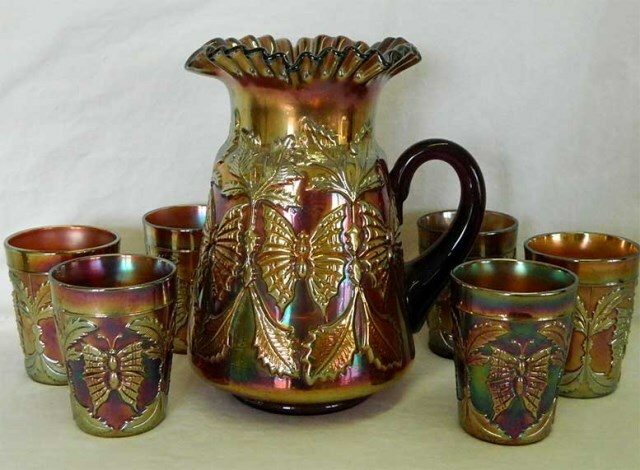 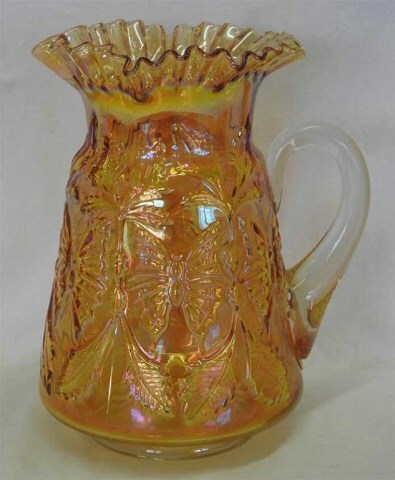 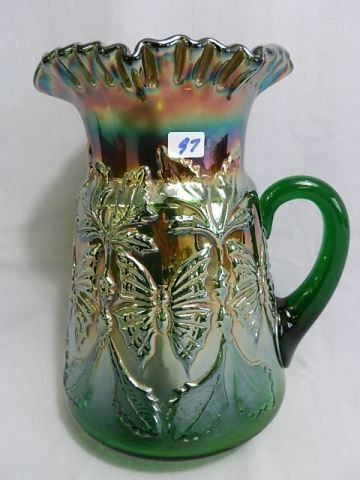 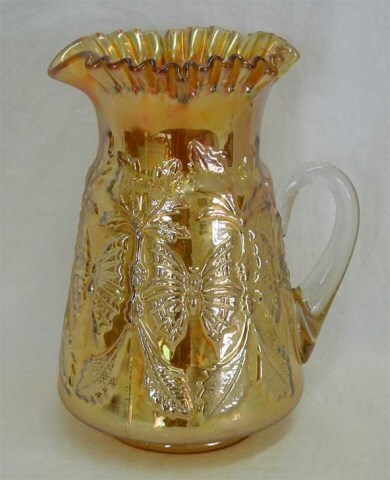 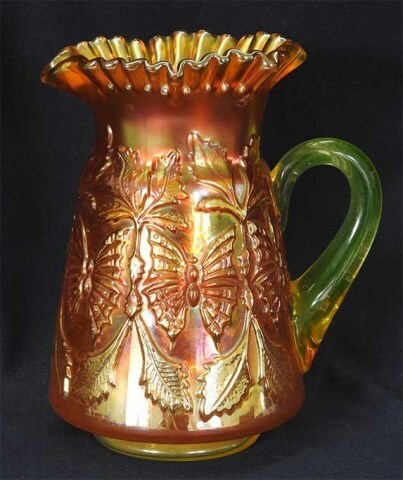 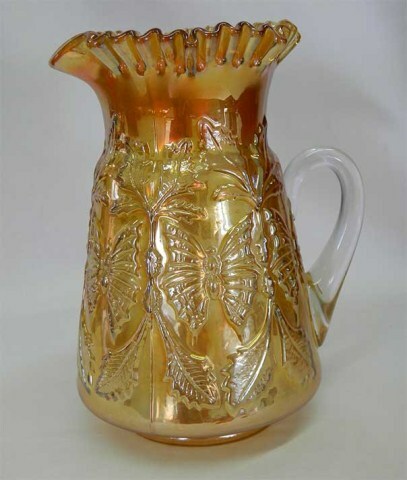 In May of 2015, Paul Hoste sent these photos of his recently acquired Butterfly & Fern water pitcher in vaseline. 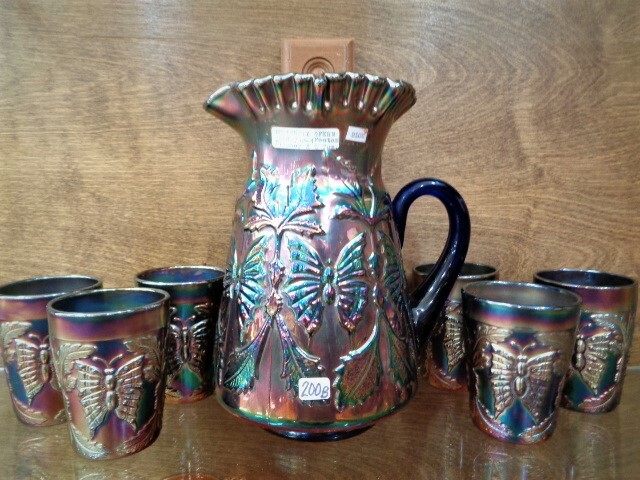 There are no records of any other vaseline pieces in this pattern. 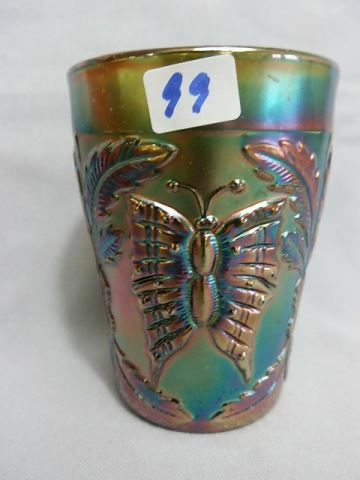 What a find. 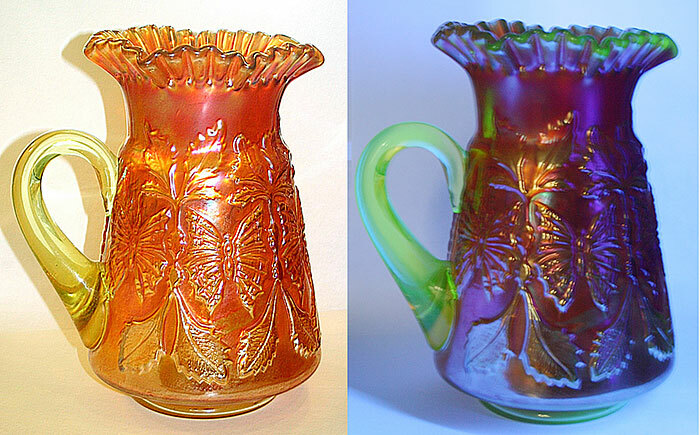 The photo on the right shows the pitcher under black light.